Labuan, an insular offshoot from the great landmass of Borneo and now an offshore tax haven, was the easternmost point in the "coconut empire". As it had been under the Straits Settlements before the war, stocks of coconut definitives ended up under the control of a Japanese administration separate from the rest of Malaya (Coulter 1965). This gave yet another boost to the diversity of the coconut definitive, for the marooned stamps were decorated with the so-called single-line overprint. First reported on the coconut definitive by an army captain by the name of Nagase (Tsuchiya 1999), it featured the Kanji characters of Dai Nippon Teikoku Seifu (Great Japan Empire Government) reading from right to left. It is not clear whether the handchops were made of rubber (Tsuchiya 1999) or steel, but the stamps were thought to have been overprinted in Kuching and Sandakan and released from 2 October 1942 (Proud & Rowell 1992) for about three months (Tsuchiya 1999). These stamps are rare and highly elusive (Carpenter 1990); less than 100 were sold and the remainder were thrown away, deemed unsuitable after Labuan was transferred to North Bornean jurisdiction (Tsuchiya 1999). Taiwanese forgeries are known (Tsuchiya 1999). 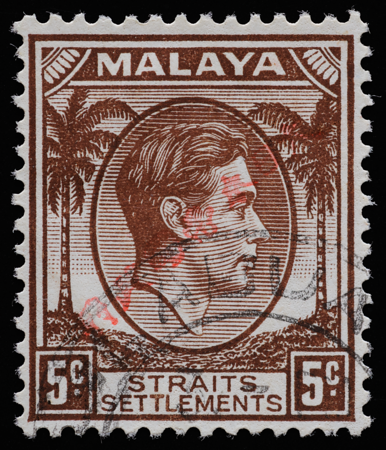 Diagonal overprints had been used elsewhere in the past, such as in Sarawak (Lardner 2016) and the French colonies (Taylor 2015).